Logan and Lansdon advising UTSA student veterans. (Feb. 7, 2019) – To advance UTSA’s progress as a student success exemplar, the UTSA Office of Veteran and Military Affairs (VMA) is taking a deep dive into better understanding and serving student veterans. Michael Logan ’11, UTSA VMA associate director, is researching effective strategies to serve and support the success of veterans and military-connected students. Logan collaborated with Amaury Nora, UTSA professor in the UTSA Department of Educational Leadership and Policy Studies, and Gerry Dizinno, emeritus associate professor of educational leadership and policy studies, to develop an instrument which measures sense of belonging as well as the factors that influence this perception, specifically among student veterans on college campuses. As a veteran of the Marine Corps and UTSA graduate, Logan is personally familiar with the challenge of transitioning from military service to higher education. “Influences affecting persistence of non-traditional students are well researched,” said Logan. “Despite the abundance of literature tying student success with sense of belonging, there is no information regarding the effect that military service has on student veterans' perception. According to Logan’s research, veterans tend to feel disconnected from their peers on campus, hindering their engagement with campus culture. The result is difficulty achieving a successful transition from military service to the higher education environment. >> Learn more about UTSA’s military community. 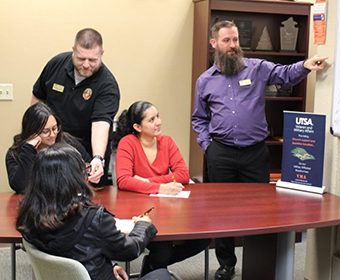 One way the UTSA VMA has worked to improve student veteran engagement and success is through a program called the Veteran Success Collaborative (VSC), which was piloted in academic year 2017-18 to assist student veterans navigate institutional barriers, primarily through peer mentoring. William Lansdon, UTSA VMA program coordinator and Army veteran, served as the lead peer mentor for this initiative. As a result, the VSC has evolved into the Military Affiliated Collaborative to better represent the services and support that they now offer. Logan and Lansdon will be representing UTSA at the National Association of Student Personnel Administrators (NASPA) Symposium on Military-Connected Students this month in Las Vegas, Nev., They are the only members of the UT System selected to present their original research at the conference. UTSA was recently recognized as the No. 6 most Military Friendly School by Victory Media. Connect with the UTSA Veteran and Military community on Twitter and Facebook.